This time, single-player is also big. Adventure mode is pretty lengthy and enjoyable and the story’s presentation is great. Thanks to the “Final Smash” moves with surprising shows of strength, unforeseen abilities arise. Options for control, sound, and so on are perfect and also deserve a hats-off. The new “Final Smash” moves with brilliant effects that can be used by any character are refreshingly fun, right up there with the rest of the battles. I’m glad the single-player mode is also bountiful. “Adventure Mode: The Subspace Emissary” keeps such a good tempo of movies and action that one easily forgets the time while playing. Awesome! Appealing production and features. Also, the movements of the characters are dynamic yet subtle. The brilliant actions of the “Final Smash” moves are a must-see. There are tons of stages, and the single-player mode is perfect. Not only is there a stage editor, but detailed statistics from the game are presented. Nice. The movements of the assembled all-stars are highly-polished, single-player is perfect and easy to get into, and the challenge of collecting herein is more than enough. With outstanding art direction, this game really lets you feel the power of motion. There are new things to discover with each play, with both joy and sorrow to be savored in battle. I wish the review had listed all the secret characters. 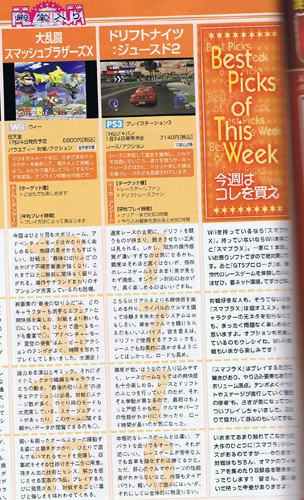 Oh well, it’s not long until the game is out in Japan and we’ll know everything there is to know about the game.